The Nikon D90 is a 12.3 MP digital SLR camera. A part of Nikon’s D series, the D90 is the follow up to the much heralded D80 – considered by many camera professionals as the ‘photographer’s camera’. The camera is equipped with EXPEED image processing that enables it to produce low noise and high quality images. It has a split second shutter response, and has a continuous shooting range of up to 4.5 frames per second – enabling the camera to capture movement from the first to the last action. The D90 was designed with a new development in digital photography, known as the DX-format CMOS image sensor, while combining technology from the previously released Nikon D300. 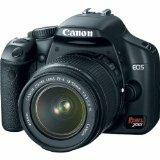 The Canon Rebel is a 12.2 MP digital SLR camera. It was a direct response to some of the more sophisticated camera technologies that preceded its design. It features technology specifically designed for Canon cameras, such as an EOS Integrated Cleaning System, a Live View Function, a DIGIC III Image Processor, and its own CMOS sensor to enhance the digital quality of the resolution. The Rebel comes complete with a 3.0 inch LCD monitor, which is compatible with SD and SDHC memory cards. The D90 comes complete with a 3 inch LCD monitor as well. It’s able to capture 4.5 images per second with an 11 point autofocus. Nikon has developed its own Scene Recognition System to further enhance the camera’s capability to recognize certain aspects of a scene, and focus the picture accordingly. Nikon also has implemented new technology to enhance the quality of photo resolution – 420 pixel 3D Colour Matrix II Metering system. This newest permutation of the D-SLR camera is the addition of a movie function – allowing the user to shoot films in three different motion JPEG formats: 320 X 216 pixels, 640 X 424 pixels, and 1280 X 720 pixels. The Rebel makes use of analogue to digital signal conversion, with the aid of a 14 bit processor, enabling the camera to generate digital data with straightforward transitions from light to dark colors (allowing the camera to capture the sky at sunset without the banding effect, for example). The Rebel also includes the technology to automatically adjust the lighting of an underexposed image. Canon has also commissioned the technology necessary to allow the lens to clean itself when dust falls on it – a Self Cleaning Sensor Unit which literally shakes the dust off of the lens when it forms. 1. The Nikon D90 is a 12.3 MP digital SLR camera; the Canon Rebel is a 12.2 MP digital SLR camera. 2. The Nikon D90 combines the DX-format CMOS image sensor with technology from the Nikon D300; the Canon Rebel features an EOS Integrated Cleaning System, a Live View Function, and a DIGIC III Image Processor specific to Canon cameras. Amitash. "Difference Between Nikon D90 and Canon Rebel." DifferenceBetween.net. March 28, 2010 < http://www.differencebetween.net/object/gadgets-object/difference-between-nikon-d90-and-canon-rebel/ >.